Minor in possession: At the age of 20, Nikcole Manriquez isn’t old enough to buy alcohol, but she already owns her own hairstyling business. How cool is it to be Nikcole Manriquez? 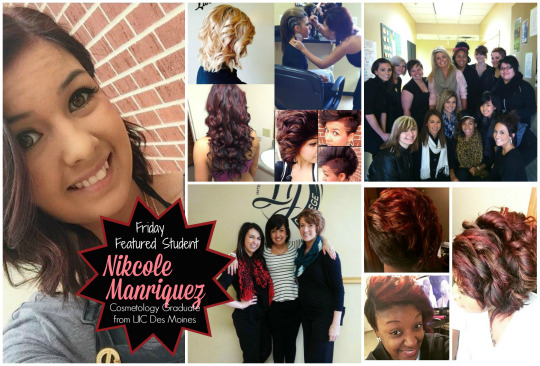 Nikcole was 17 years old when she enrolled at La’ James International College. She graduated from our Johnston campus just one year later at the age of 18. She’s 20 now and it’s been two years since she graduated with a cosmetology degree. She’s not old enough to buy alcohol, but as of this writing, she’s been in business for herself for two full weeks now. “I’m doing a lot of thing that most 20 year olds don’t do,” Nikcole said when we finally were able to catch up with Des Moines’ newest rising star in the cosmetology community. Nikcole is her own boss. After two years of working hard to gain experience and hone her skills at a Cost Cutters Hair Salon, she decided to go out on her own and rent a chair in an upscale salon named Amore in Pleasant Hill, a suburb of Des Moines. Nikcole tells us that she loved her manager and co-workers at Cost Cutters and that she had a flexible schedule, but she finally decided it was time to make a move. “I said you know what? I’m going to do it!” Nikcole tells us that she’s now making her own hours, setting her own schedule, and writing her own paychecks. She comes to work when she wants and locks the doors when she leaves. The future is bright for this young dynamo. Nikcole knows the value of hard work and has the kind of attitude that’s necessary to attain success. What are you doing with your dreams? Contact LJIC today!